Civilian Public Service camp 126, Beltsville, Maryland. Milking. Civilian Public Service camp 126, Beltsville, Maryland. Experiments. CPS Unit No. 126, an Agriculture Experiment Station unit located at the Agricultural Research Center near Beltsville, Maryland and operated by Mennonite Central Committee, opened in February 1944 and closed in December 1946. 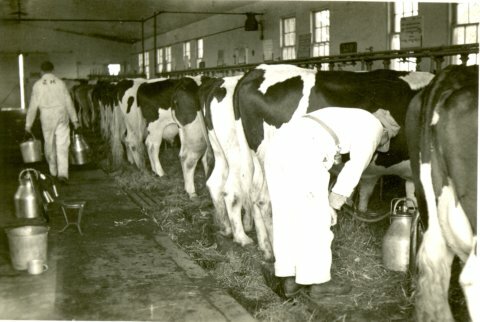 At this unit called Beltsville Research, men relieved labor shortage at the Dairy Station housing a five hundred cow herd. The unit, located at the Agricultural Research Center near Beltsville, Maryland not far from Washington, D.C., relieved the critical labor shortage at the Dairy Station. The men performed many duties and experiments required to determine which cows in the herd of five hundred could be kept and fed at a profit. The men, selected from the Mennonite base camps, reported affiliation with Mennonite denominations when they entered CPS. In August 1945, of the men performing dairy service work in CPS, over five hundred and fifty were from Mennonite camps, over three hundred from Brethren, and about forty from Friends camps and units. The unit began with fifteen men and grew to thirty. After V-J Day, the unit gradually decreased as the men were released from CPS. The men performed a variety of duties to increase the productivity of individual cows. They bred and selected for production, which involved inbreeding and crossbreeding. They milked the herd, prepared silage and cured hay. 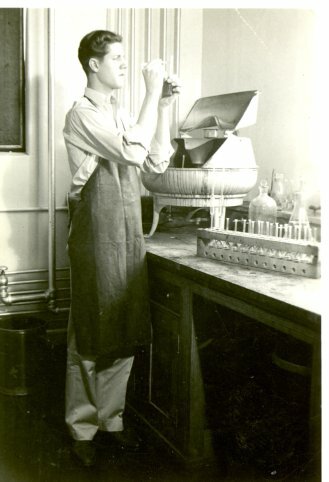 They conducted experiments in dairy hygiene, frequency of milking, pasturing options, insecticide control, as well as countless nutrition experiments. For those desiring to learn about the dairy industry, the work proved valuable even though difficult. The project superintendent, confident in the COs, even though his superior did not understand them, relied on the men to assume positions of responsibility. The men lived in the second floor of one of the dairy laboratory buildings in quarters described as “comfortable”. They organized into a camp council as well as religious life and recreation committees. The religious life group provided an active program of Sunday morning services, prayer meetings, Sunday evening meetings, in addition to special meetings. The men led many of the activities, but during the two-year life of the unit, sixty-eight different ministers conducted services. The men enjoyed many opportunities for creative leisure time in nearby Washington, D.C.
For more information on dairy farm units, see Melvin Gingerich, Service for Peace: A History of Mennonite Civilian Public Service. Akron, PA: Mennonite Central Committee printed by Herald Press, Scottdale, PA 1949, Chapter XV pp. 190-212. For more information on women COs see Rachel Waltner Goossen, Women Against the Good War: Conscientious Objection and Gender on the American Home Front, 1941-47. Chapel Hill, NC: The University of North Carolina Press, 1997. See also Mulford Q. Sibley and Philip E. Jacob, Conscription of Conscience: The American State and the Conscientious Objector, 1940-47. Ithaca, NY: Cornell University Press, 1952.